No case, Myers got caught in an awkward spot. I dont think so. Maybe because he is a left footer, but he just looks só onesided. Cost a goal today not being able to execute a short pass on his left. If injured, he will go out for Langford I think. Thought he was quite poor and got caught ball watching several times and allowing players to amble past him. He stalled our attack quite a few times as his instinct is to look backwards or get on to his left foot. Yeh ok maybe the afterglow. He had a few good contested moments. I really don’t know what to think about that one. Some angles it looks deliberate. Others there is contact from ambro. Not a tunnel but certainly contact. Quality game. Did the grunt work at stoppages when required, fed the ball out well and used the hoof judiciously. The usual blocks in packs that free us up and only coaches/ teammates seem to value. Wasn’t exposed as a mid. Nope. tunelling or not (which i dont think it was) thats a clear raised boot kick to the face. Whether a report or not, should have been a free kick. Gave us more than Mutch? Mutch went off with a severe hamstring injury in the first 5 minutes of the match last week. Not sure that’s a fair comparison. Wasn’t Greene of GWS rubbed out for a week for stops up while marking? Yes Toby Green was out for a couple of weeks holiday and I think a new rule was bought in to stop that sort of play, wasn’t it? Someone else has had a holiday for doing the same thing under the new rule I just can’t remember who it was. $1500 fine. But that was the first time it had been reported. Hipwood should get weeks if the AFL is serious about protecting players’ heads. 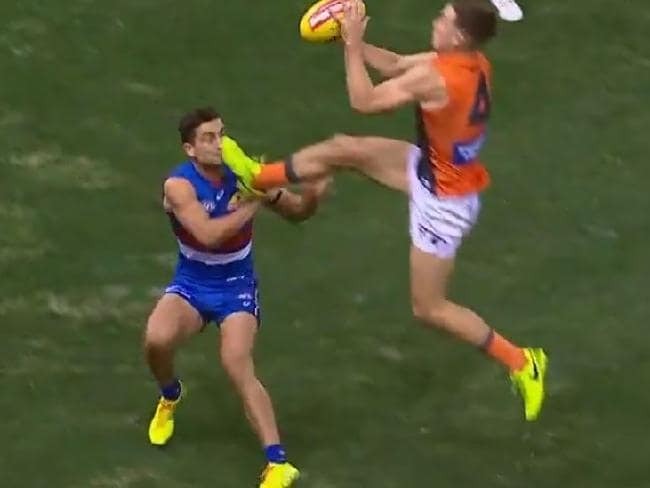 TOBY Greene will pay a $1500 fine for his boot to the face of Western Bulldog Luke Dahlhaus, escaping a third suspension for the year. The controversial Greater Western Sydney star was slapped with the fine after the match review panel rejected the initial umpire report for rough conduct, which could have carried a two or three-week ban. Instead the panel found the All-Australian small forward guilty of the lesser offence of “misconduct”. The Giants breathed a sigh of relief on Monday afternoon and immediately accepted the fine dished out to Greene. 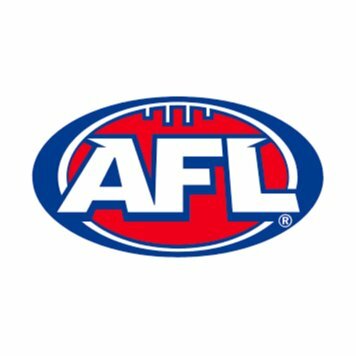 Premiership coach Paul Roos had called for a strong statement against the action and welcomed the financial penalty. Toby Greene collects Luke Dahlhaus in the face on Friday night. He said the panel had to make it clear such acts had no place in the game, expressing concern at the message sent to juniors. “The only debate should have been around what the penalty was going to be,” Roos said. “I was surprised at people that said ‘He’s just protecting himself’. If that’s the case, then why wouldn’t we teach kids to do exactly what he did? “I’m glad that we’ve clarified that it’s outside the rules, and I’m also glad for Toby that he’s playing, because I don’t think he intentionally kicked him in the head. Greene’s latest incident is his second misconduct penalty for the year, on top of two two-game suspensions for striking. Roos described the Etihad Stadium incident as “unique”, but that a similar act in the future should trigger more than a financial sanction. “Perhaps the panel is saying, ‘We’ll fire a shot across someone’s bow and we hope that we don’t see it again’,” he said. Giants football boss Wayne Campbell acknowledged in accepting the sanction that the incident had sparked strong debate, but said he felt that the panel “has judged it on its merits”. “Toby had his eyes on the ball the whole way and didn’t intend to make high contact with his opponent,” he said. 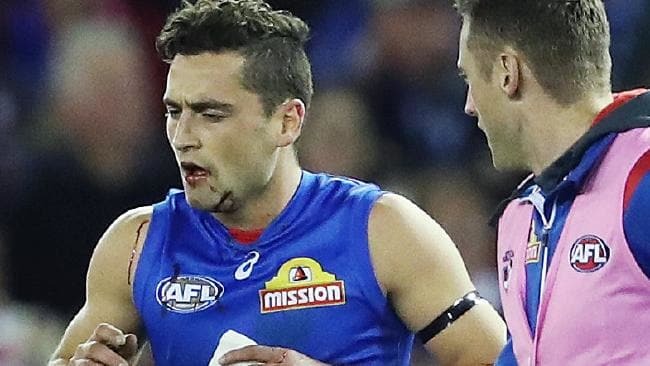 Dahlhaus left the field on Friday under the blood rule but returned to play out the game, and told the Sunday Herald Sun of his shock as the boot came towards his face. He had a staple in the left side of his chin that remains in place. Five-time premiership player Dermott Brereton said he thought the panel would elect to suspend Greene, but backed the financial penalty. “He’s inventive. He saw that handball looped up in the air, he knew he was going to be shut down in the tackle and he puts his foot up,” he said on SEN.
“It’s unfortunate that Dahlhaus is 179 centimetres and lowered his height as well and literally ran into the boot. Former Bulldog Luke Darcy had no doubt about the outcome for Greene. “I think Toby Greene is a skilled enough athlete to know where he’s going to put his boot, and I think he genuinely put his boot into Luke Dahlhaus’ face,” Darcy said on Triple M.
Brownlow medallist Chris Judd said he believed Greene had a case to escape sanction. “There was no doubt that there was definite contact to the head and it’s not a good look for the game,” Judd said. Champion forward Wayne Carey was adamant Greene should be let off. “It was purely an accident,” Carey said. “I think you see players often jump and put their foot up to protect themselves when they’re going for the ball, whether it is a marking contest or not. Cannot be any sanction for Hipwood who is facing the footy, has eyes on the ball above his head and Myers is running with the flight. Gutsy thing to do but onus is on him, hope young Hippy doesn’t cop anything. It would be ridiculous. The question to be asked is - was Hipwood careless/reckless is sticking out his boot in the circumstances. He made a move that should have been a free kick and contacted a players head in a way that saw him not take any further part in the game. Would never have been a suspension before, but could be this year. Who’d know the way this shitshow is run. It will come down to interpretation and Hipwood is a tall guy who is facing the footy with his head and eyes tilted skywards and toward the ball. Myers seemed to misjudge where he was in the contest and put himself in a position that Hipwood might not have reason to foresee. I’m certain there will be no case to answer. Just hope he’s ok. Happened in front of me, didn’t notice the impact but he spent a lot of time lying still on the ground.